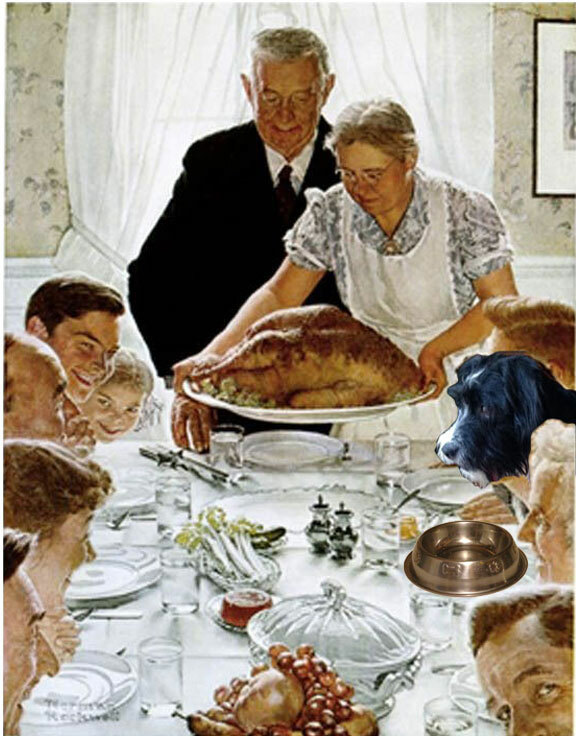 Yet Thanksgiving is a joyous holiday for dogs, one that dates back to the harvest feast of 1621 in Plymouth when members of the Mashpee Wampanoag tribe – or Native Americans – broke bread with Puritan settlers – or Immigrants-Who-Decided-They-Were-Now-The-Native-Americans. During the historical confusion, much of that broken bread fell on the floor and was quickly consumed by Non-Partisan dogs who wondered why everyone was shouting. Like many dogs, Budleigh acquires table scraps by keeping a low profile and blending in. Dogs are primarily carnivores, or “meat eaters”, unlike humans who are omnivores, or “prone to heart attacks”. While dogs thrive best on a meat-based diet, they are naturally drawn to anything that is peanut-butter-shaped and will eat almost any food. Also any packaging materials. Oh, and bras. Humans have been feeding table scraps to canines since Prehistoric Man first lost a hand. Having learned nothing from that, many continue the practice, especially at the holidays and much to the detriment of dogs. The list of common Thanksgiving foods that can be harmful to dogs is easily available online or through your veterinarian. As a precaution during the holidays, have the phone number for Animal Poison Control readily available. Ask for Jeremy. The best way to safeguard your pet from ingesting unhealthy foods is to keep him away from Uncle Max. Especially in homes with multiple dogs, guests should be warned to guard their unattended hors d’oeuvres, drinks, and purses. Dogs like Brisby, our innocent schnoodle, and Budleigh, our thug, cooperate in packs much the way Dickens’ street urchins work in organized crime syndicates. GIANT FAGIN: (Sighing) “And what have you, young Budleigh, my fine terrier? To a dog unaccustomed to crowds, the stress from a sudden houseful of guests can also be toxic, especially if they’re your family. Keep pets from becoming overexcited by providing them a safe, comforting sanctuary such as a separate room or their crate. Firmly caution guests away by posting a small sign on the door reminding them that “He’s Rabid! !” Even then, your dog might require further protection. “Jewoof!” I’ve read this to my dogs in heaven. How many, I forget, but I can ask Uncle Max, I guess. Best ever, Master Dave. Have a growly Thanksgiving! Hahaha! Since I leave my bra around the house randomly, (wherever I am when I reach my bra-wearing limit for the day) it’s a good thing I don’t have a dog right now. I fear the underwire might choke the innocent canine.